On Tuesday, Nov. 18, the United States Mint released its latest America the Beautiful Quarters Three-Coin Set. 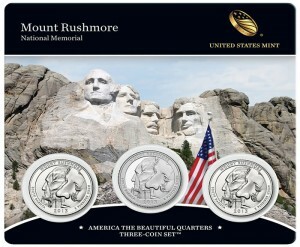 This fifth and final one for this year and the 20th in the series overall has three mounted 2013 Mount Rushmore National Memorial quarters. On Thursday, September 19, the United States Mint issued its newest America the Beautiful Quarters Three-Coin Set. This fourth one of the year and the 19th in the series has three mounted 2013 Fort McHenry National Monument and Historic Shrine quarters. The latest America the Beautiful Quarters Three-Coin Set made its debut this past Tuesday, June 25, 2013. The third of the year and the 18th in the series includes three Great Basin National Park Quarters. 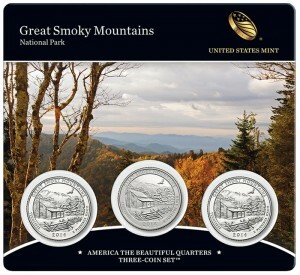 On Tuesday, April 16, 2013, the newest America the Beautiful Quarters Three-Coin Set was released. 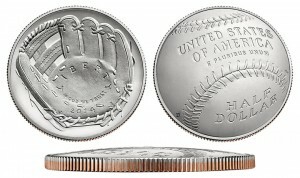 This 17th issued set has three 2013-dated Perry’s Victory and International Peace Memorial Quarters. 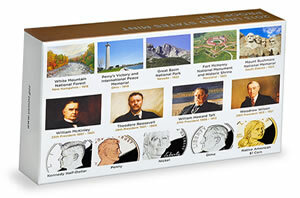 Making its entrance more than a month earlier than last year’s issue, the 2013 Proof Set goes on sale at 12:00 noon ET on March 28, 2013. 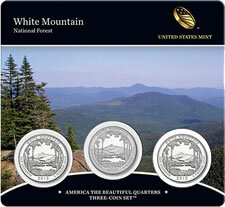 On Tuesday, February 12, 2013, the U.S. Mint released the White Mountain National Forest Quarters Three-Coin Set. 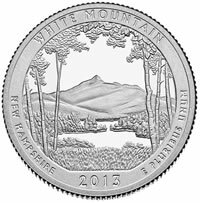 Starting on Monday, Jan. 28, 2013, the United States Mint will offer circulating quality White Mountain National Forest Quarters in bag and rolls. Newly 2013-dated American Gold Eagle bullion coins in one-ounce, half-ounce, quarter-ounce and tenth-ounce sizes debut very early next month. 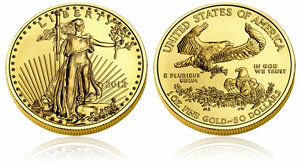 The U.S. Mint will begin accepting orders for the 22-karat gold coins on January 2, 2013.